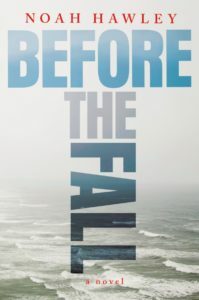 Before The Fall by Noah Hawley was one of the hot books pushed at BEA last spring. (It was even featured on the BEA lanyard strings, which isn’t cheap.) Hawley is best known for creating and writing the FX series Fargo, but I know him from an earlier novel he wrote called The Good Father. I don’t think it got a lot of attention when it came out, but I really liked it and was intrigued when I came across Before The Fall. Before The Fall is a thriller/mystery. A private plane takes off on a Sunday night from Martha’s Vineyard, headed to New York. The plane was chartered by a very wealthy family, the Batemans, who have two children aged 9 and 4. The Batemans invited another couple to fly back with them – a banker and his wife – and at the last minute an artist shows up for the ride, having been invited earlier that day by Mrs. Bateman. There are also three pilot/crew members and the Batemans’ bodyguard. Eighteen minutes after the plane takes off, it crashes into the Atlantic. The only two survivors of the crash are the artist and the Bateman’s four year-old boy. So what happened? Did the plane malfunction? Was it pilot error? Did someone purposely take the plane down? As the story teases out, we learn that both David Bateman and his banker friend had secrets to hide – did their shady business dealings have anything to do with it? And is the artist who he claims to be? What about the crew? Hawley follows each of these threads, flashing back in time to flesh out these characters’ stories, until he finally reveals what caused the fatal crash. Overall: meh. Before The Fall kept my attention, and for that alone it wasn’t bad. I enjoyed the character development and found the backstories of these doomed passengers pretty interesting. But I had a bunch of problems with the book too. First, the character of the artist bothered me. He did and said things that made no sense and seemed so bizarre to me, yet no one else appeared to notice. Second, this book reads like a screenplay (for which the movie rights have probably already been sold, right? ), which I’d forgive Hawley for if I hadn’t read The Good Father, which didn’t at all read like a screenplay. I expected more. There are also little inconsistencies and impossibilities throughout the book that I found distracting. The plane took off after 10 on a Sunday night, and a Red Sox game was on, which is pretty unlikely unless it was in extra innings (it wasn’t). At one point the artist gave the boy a pen that he had had since he was a little boy, which made no sense because the artist swam to shore after the crash and his bag was not recovered, nor had he returned home since the accident. People talked on landline phones with long stretchy cords (seriously?). Just sloppy. The ending was underwhelming too. I can think of like 5 other more satisfying explanations for the plane crash. I’m glad I read Before The Fall because I was curious about it, and it was an engrossing vacation read. But in the end it left me cold. Proceed at your own peril.